Investors are concerned that with high inflation, a weak economy and fallout from a global selloff in emerging markets, Argentina may have problems meeting its dollar debt obligation in 2019. "We have agreed with the International Monetary Fund to advance all the necessary funds to guarantee compliance with the financial program next year," Macri says. Argentinian President Mauricio Macri speaks during a joint press conference with German Chancellor after their meeting n Berlin, Germany on July 05, 2016. Argentina is asking the International Monetary Fund for early release of funds from the country's $50 billion standby financing deal, President Mauricio Macri said in a televised address on Wednesday, a move aimed at calming turbulent markets. The country's currency has weakened 40.79 percent in 2018. Investors are concerned that with high inflation, a weak economy and fallout from a global selloff in emerging markets, Argentina may have problems meeting its dollar debt obligation in 2019. "We have agreed with the International Monetary Fund to advance all the necessary funds to guarantee compliance with the financial program next year," Macri said. "This decision aims to eliminate any uncertainty." The Argentine peso dropped to trade more than 6 percent lower against the dollar on the news. 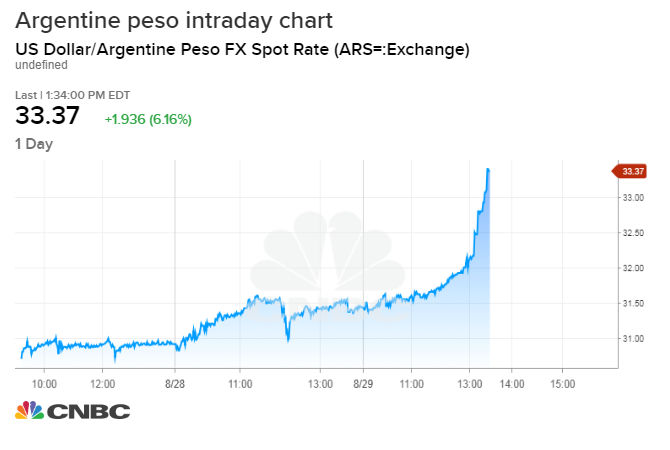 Argentina's central bank sold a total of $200 million of its reserves in two currency auctions on Tuesday after the peso hit new lows. The currency weakened to a record close of 31.50 per dollar after touching an all-time low of 31.60 to the greenback earlier in the day. Central bank shows it has sold $12.881 billion in the foreign exchange market this year as monetary policymakers try to stabilize the currency. The government says it expects the country's economy to contract 1 percent in 2018 but grow by at least 1.5 percent next year.